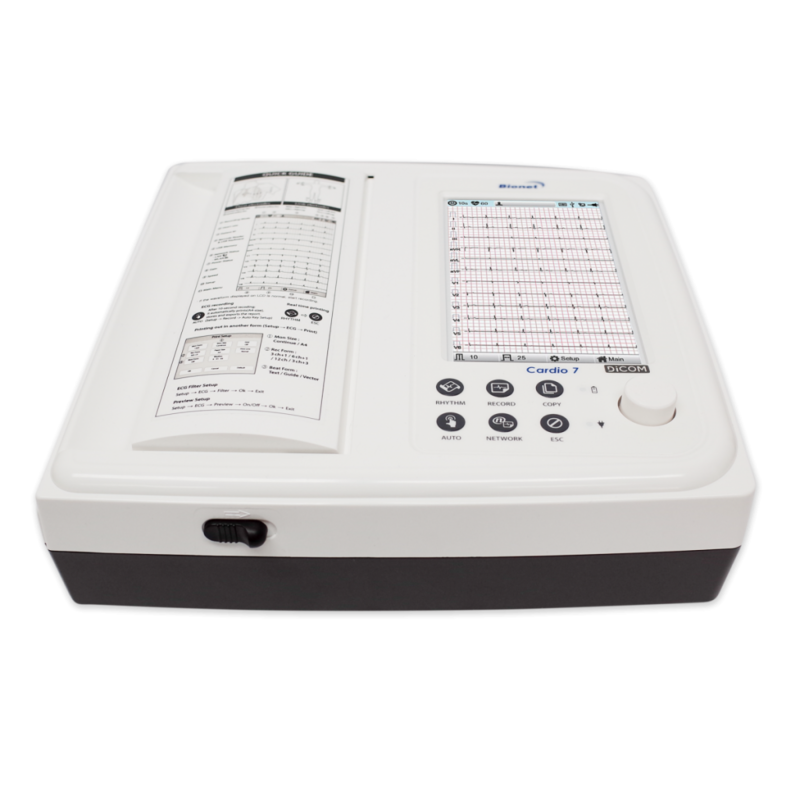 The Bionet Cardio7 Resting ECG is economically priced and reliable. It features a large 7” TFT LCD touch screen, supports USB flash drive, a QWERTY keyboard, 5 minute recording time and storage of up to 120 patients. The Cardio7 is the most efficient and cost-effective 12 channel ECG, featuring print outs in multiple formats, including 12, 6 and 3 channel reports. Cardio7 combines menu-guided touch screen technology with a convenient rotary key to maximize ease of use. Store up to 120 ECGs in internal flash memory and the saved ECGs can be saved to an external USB flash drive PDFs or JPEGs to a flash drive. The ECG printout offers detailed interpretation information in beat report format to aid in diagnosis. Provides 5 minute recording with HRV analysis, and 3 channel + 3 rhythm report. Supports Pediatric Interpretation. The Cardio7 uses normal fax paper which costs about ¼ the cost of ECG paper. It will even generate its own grid! The Cardio7 will produce full size A4 printouts in 1, 3, 6 and 12 channel formats. Full size print-outs improve readability and make it easier for filing in the patient chart.